Last week, I erroneously proclaimed issue #16 of Ares to have been its last, since I'd never seen an issue beyond that one. Thanks to a kind reader, I now have, along with the two "special editions" TSR also produced during its time publishing the magazine. So, in the interests of completeness, I'll be looking at these three remaining issues over the coming weeks before bidding adieu to Ares. Afterwards, I'll start up a new series, focusing on the TSR UK periodical, Imagine. Issue #17 is not dated. Instead, it's called simply "Final Issue," though, since issue #16 is listed as "Winter 1983" and the first installment of "the Ares Section" in Dragon is April 1984, it's safe to assume that it appeared sometime between January and April 1984. The cover art is by Mitchell O'Connell, whose artwork I so strongly associate with Pacesetter's Star Ace RPG. The interior layout of the issue looks even more like what we'd eventually see in the pages of Dragon, which only makes sense. For me, seeing it in a full-length magazine is somewhat thrilling, given my fondness for the Ares Section and my wish back in the day that Dragon expanded its coverage of science fiction even further. Production costs (in terms of time, energy, and money), compared to the actual readership, were major factors; the circulation was not high enough to justify the workload in making it go. This is hardly surprising, given the relative unpopularity of science fiction compared to fantasy in the gaming world. Likewise, the handling of TSR's takeover of SPI, while not done maliciously, was bungled, alienating a great many of the people who might otherwise have supported Ares. At the same time, I do think TSR genuinely tried to make Ares successful, even if some of the changes they made probably also alienated some of its existing subscriber base. In terms of actual content, issue #17 includes an article called "Of Writers, Editors, and Horror Stories" by David J. Schow, in which he talks about his experiences as freelance writer. It's a fine piece for what it is, though it's an odd one to include in the final issue of Ares. Meanwhile, James M. Ward provides "Fun Among the Mutants," which discusses games and pastimes of the cryptic alliances of Gamma World. "Sword in the Dirt" is a bit of short fiction by Henry Melton, while Steve Winter's "Pancake Alley" provides guidelines for rally racing in Car Wars. "A Friendly Game of Hoople" is a second -- and lengthier -- piece of fiction (by Timothy Robert Sullivan). The significant portion of issue #17 is taken up by "Mongoose & Cobra," an adventure for Universe written by Nick Karp. The adventure takes place in the Chara system, on the planet Gardenia, which has recently been menaced by space pirate attacks, which the characters are hired to deal with. For its length, I can't say I found "Mongoose & Cobra" particularly inspiring. Like so much material for Universe, there are a lot of good ideas here but they're presented in the driest, most unexciting way possible. William Tracy offers "The Zamra," which describes a racial weapon of the Yazirians from Star Frontiers. Carl Smith pens "Fire at Will!," which describes methods of using miniatures to play Knight Hawks. Marvant Duhon's "The Federation Strikes Back!" is an expansion to Universe's starship construction and combat rules. "Sword and Sorcery in Supergame" is an odd article. Written by Jay Hartlove, it provides rules and advice on adapting Supergame to the fantasy genre. Supergame is apparently a superhero RPG, but I've never heard of it. I find it difficult to imagine that it had a very wide currency in 1984 either, so its inclusion here suggests that Ares had difficulty finding articles to publish in its pages. Rounding out the issue are a number of reviews of both books and games. Not included this time around is an integral game/simulation, making issue #17 different than all of its predecessors. 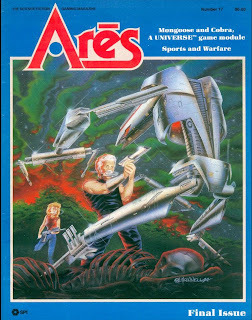 I suspect that the cost a lot of the cost prohibitions that spelled the end of Ares stemmed from its integral games, so it's hardly a surprise to see it missing. The story of Ares magazine becomes more interesting with each issue I read. It's quite clear that, ultimately, its demise was born in the great differences between the cultures, both corporate and consumer, of SPI and TSR. Even under the best of circumstances, it seems unlikely that the periodical would survive its takeover by TSR, which, as I've said repeatedly in this series, is a shame, since I think there was much potential in Ares. I just picked up a bunch of Imagine Magazines in my on going desire to bolster a number of the Wikipedia articles on gaming. Looking forward to seeing what you do with this. I never read Ares as a stand alone magazine, but I certainly enjoyed it's inclusion in Dragon. Jay and Aimee Hartlove really tried hard to promote their game, Supergame in the early '80s. There's an article in the X-Men issue of Different Worlds, for instance, which includes stats for several comic book characters to the system (the rest of the superhero game articles in the issue only convert the X-Men as they existed at the time, which seems to indicate that the Hartloves were either misinformed about the theme of the issue or the article was written without reference to the actual theme and published because that's what was available). The problem was that it was not a very good game at all, in several senses. One of these days, I should write up an Obscure Games review of it on my blog. Supergame is an interesting read. It has some systems that have had some long term legacy in superhero gaming -- though not as much as Superhero 2044 (which I blogged about here: http://www.advanceddungeonsandparenting.com/2012/03/from-archives-surprised-by-superhero.html). Supergame was a part of the "west coast" gaming movement, and I found my copies buried in a pile of "throw aways" at a local gaming store in SoCal. When I get my copy of Different Worlds #23 from the Arneson auction, I can send you the reprint copy of that issue that I currently own. That issue of different worlds has articles about Champions, Superworld, V&V, Superhero 2044 and Supergame. I'm actually thinking of trying to give Supergame a spin. It looks overly complex, but has some ideas I'd like to see in action. That account doesn't seem to match the journalism as presented in Fire & Movement when they published the TSR buys SPI issue. You can read about the SPI takeover in Fire & Movement #27. I blogged about the issue a few months back. Advanced Dungeons and Parenting or Cinerati -- they are the same blog. I do recommend buying the issue of F&M. Cool. Found and read. Interesting article about the history of the hobby. 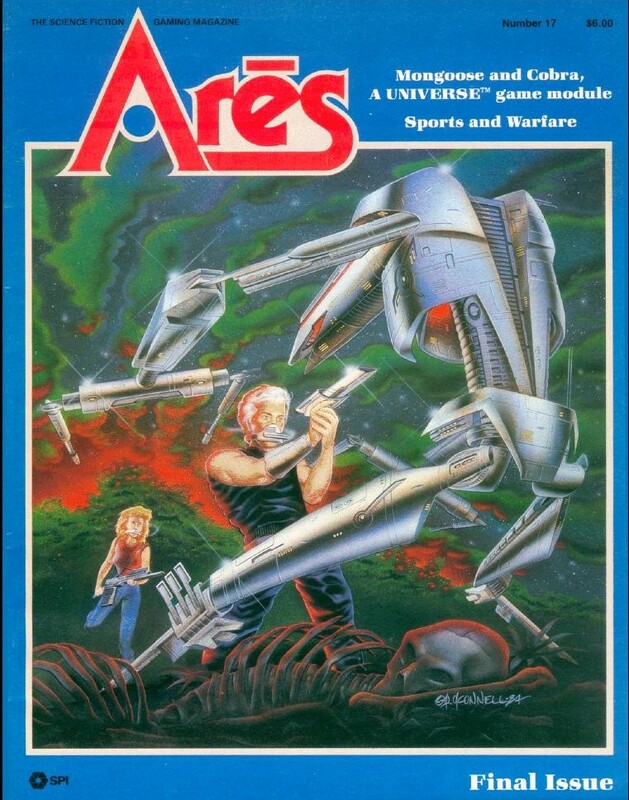 This was actually the only issue of "Ares" that i owned as a kid. I bought it for the "Gamma World" article and was puzzled at the time by the material for "Universe," a game neither I nor any of my friends had ever heard of or seen. properties (most of this loan went directly to the "venture"
principal officers of SPI itself for a brief time. note and in essence, foreclosed on SPI. We were dead. End of a great era in wargaming. Personal accounts are fine, but I prefer journalism done at the time. You can also look at the Different Worlds timeline of SPI. Simonsen was one of the few SPI people who moved over to TSR for any period of time, and unless Simonsen talks about the initial attempt to sell SPI to Avalon Hill and the eventual move to Avalon Hill of the majority of SPI staff as TSR was taking over, I think his recollection may be selective. Thanks for posting the article, it does include some of the information I had hoped it would include and it paints an interesting picture. I still think that when the SPI staff left for AH, they took everything of real value away from TSR. TSR tried to claim they assumed "none of the liabilities" of SPI, but the printers owned the plates and weren't going to let TSR use them without payment and SPI's staff were their real asset. TSR got almost none of the staff.